Commerce’s announcement and accompanying fact sheet on the preliminary duty order did not provide any rationale or methodology for how it calculated the 220 percent duty. The CSeries starts at $79.5 million, according to list prices, but carriers usually receive discounts of about 50 percent. If imposed, the duties would more than triple the cost of a CSeries aircraft sold in the U.S. to about $61 million per plane, based on Boeing’s assertion that Delta received the planes for $19 million each. Bombardier has disputed the $19 million sales figure. There are not that many Commerce countervailing orders that are this high, but it is lower than the 256 percent final duties slapped on Chinese cold-rolled steel last year. The timing is awkward because Canada and the United States are in a three-way negotiation involving Mexico to modernize the North American Free Trade Agreement..
A source familiar with the Canadian government’s thinking said the Boeing trade dispute was “separate” from the NAFTA talks. The spat between Boeing and Bombardier has snowballed into a bigger fight this month when British Prime Minister Theresa May asked President Donald Trump to intervene in the dispute to help protect jobs in Northern Ireland, where Bombardier is the largest manufacturing employer. he United States has also faced opposition from a handful of American carriers and elected officials over potential U.S. job losses. 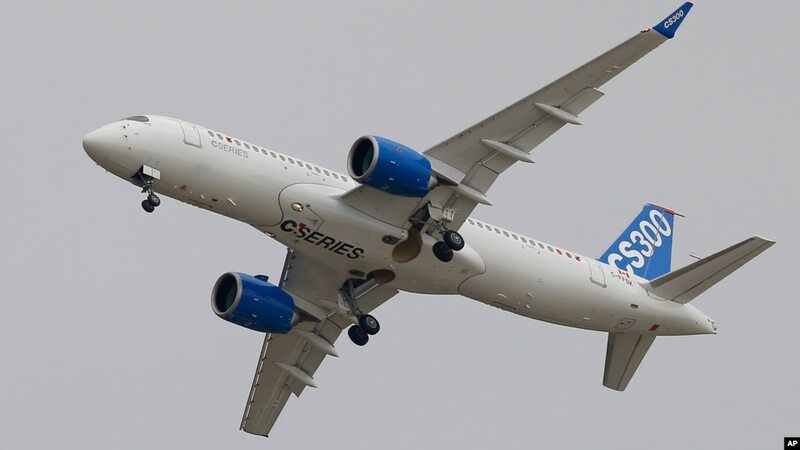 Canada’s foreign affairs minister Chrystia Freeland said Bombardier CSeries components are supplied by American companies that support almost 23,000 jobs in U.S. states, including Connecticut, Florida and New Jersey. “This is clearly aimed at eliminating Bombardier’s C Series aircraft from the U.S. market,” Freeland said. She added that Canada strongly disagrees with the anti-dumping and countervailing duty investigations. Bombardier’s was unwilling to swallow the extra cost for airlines if the United States slaps duties on its CSeries jet, Reuters reported on Tuesday, citing people familiar with the matter. “We are confident...no U.S. manufacturer is at risk because neither Boeing nor any other U.S. manufacturer makes any 100-110 seat aircraft that competes with the CS100,” Delta said in a statement. Duties could chill U.S. sales of the fuel-efficient CSeries, raising concerns over future orders and jobs in Canada and the United Kingdom.